commented on "PRODUCT INFORMATION ..."
Although this product is new to floraculture, a simpler form of it has existed in agricultural circles for decades. In many countries including the Middle East where rain is scarce and availability of fresh water is limited, the product was dispersed onto the fields so that when it did rain or dew fell, the excess water would be absorbed and retained for drier days. The product has developed drastically over the years allowing for absorption of nutrients as well as water, which makes the product a complete substitute for soil and water. The material is also completely biodegradable so can be put into the garden when unwanted and will break down into the soil. 1.Empty the contents of one package (coloured balls) into 1 litre of water. For best results also add 1 teaspoon of liquid fertilizer (e.g. - Thrive). 2.Let contents soak in water for 6-8 hours. 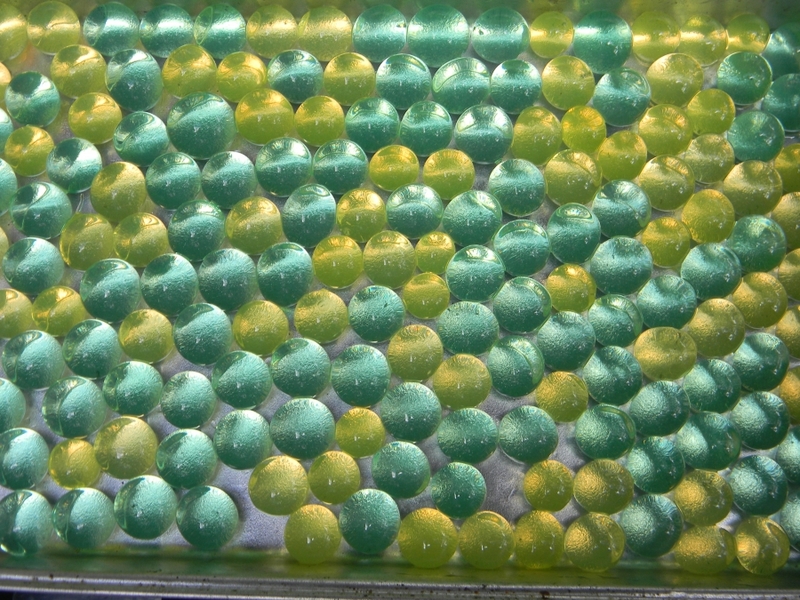 After this time it will be clearly evident that the coloured balls will have increased in size tremendously, as they will have absorbed water. 3.Using a strainer, remove the colored balls from the water & place them into a container of your choice (Vase, Flower Pot). 4.Place the plant in the container after removing as much soil as possible from the plant's roots. 5.Should the plant have no soil @ all, simply place it upright in the container with soaked balls. The plant will develop normally and will last for a long time. After approx 1.5 - 2 months the floraculture balls will have shrunk in size, add water to the container with the plant approx 3-4 hours, or until they reach their maximum size again. Repeat the straining process removing the plant while doing so once strained put the plant back in with the balls. As easy as that! Also if using for cut flowers hydrate the balls in water for 6-8hr or even better overnight, drain the excess water put the flowers in the vase adding the balls after so as not to damage the balls and arrange the flowers. Add some water at the bottom of the vase so as to supply the cut flowers with water asap. Floraculture balls can last up to 4 years if they are kept away from direct sunlight (UV rays) and are handled with care. The material is biodegradable and will eventually break down. During their lifetime they will shrink and rehydrate constantly. Floraculture balls can simply be rinsed with water to wash any dirt or dust off of them. Diluted lemon juice or diluted vinegar can be also be used if mild algae growth has taken place. if algae has fully developed (if the balls look cloudy) wash them with diluted liquid fertilizer to kill any living bacteria. To store them for future use rinse them in some water and diluted lemon juice or vinegar for a very short time and put on a metal tray on top of the fridge for a few days. Once reduced place the hardened beads in a zip-lock bag and store them in a dry place and at room temperature until required again for hydration.